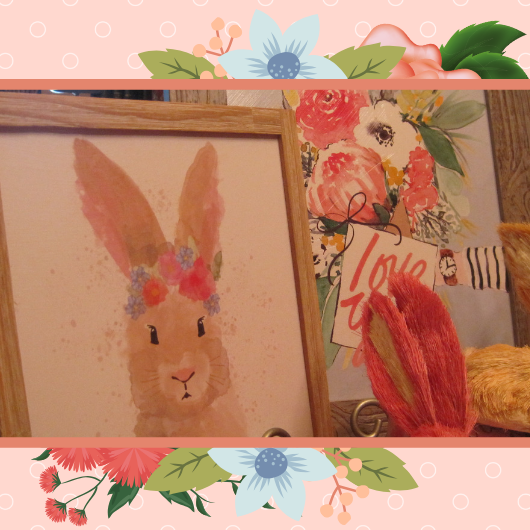 My Halo Bunny Easter tablescape was built around this painting that I found at Kirklands. 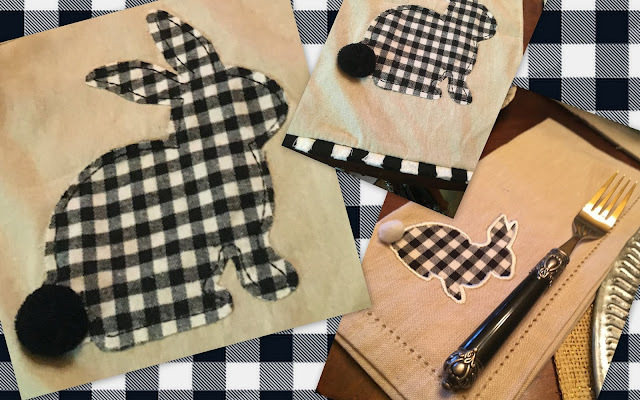 As I shopped that day, I found something at Pier 1 that was perfect and a couple weeks later, I found bunnies at Tuesday Morning. The remaining elements came from my closets and cabinets! 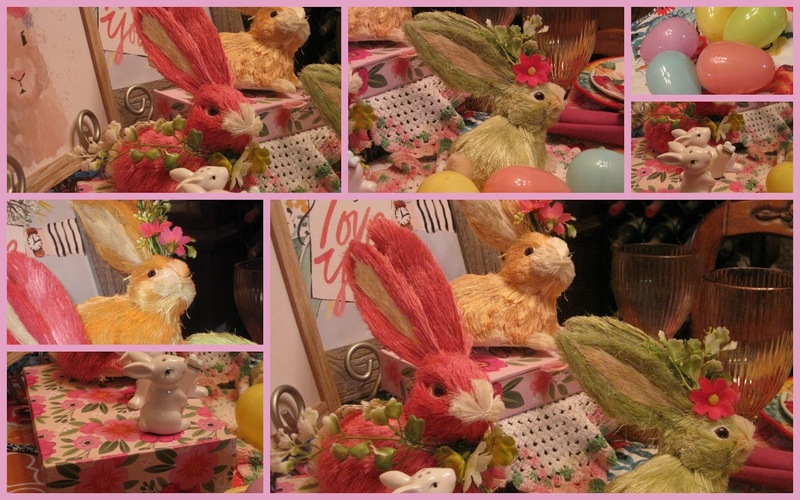 I was so surprised to find these straw bunnies in coral, yellow and sage green ... and of course I had a bag of plastic Easter eggs that matched those colors. 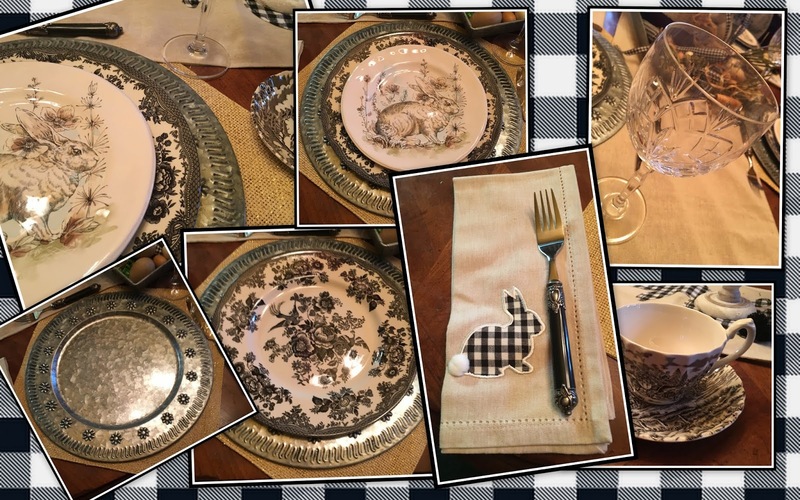 My place setting is a mixture of many things ... Pioneer Woman dinner plates atop Walmart place mats; Fostoria stemmed glasses from the 1980s; Cambridge flatware in perfect colors; Pier 1 salad plates with the cutest bunny and squirrel! This tablescape is all about SPRING with bright colors and flowers. 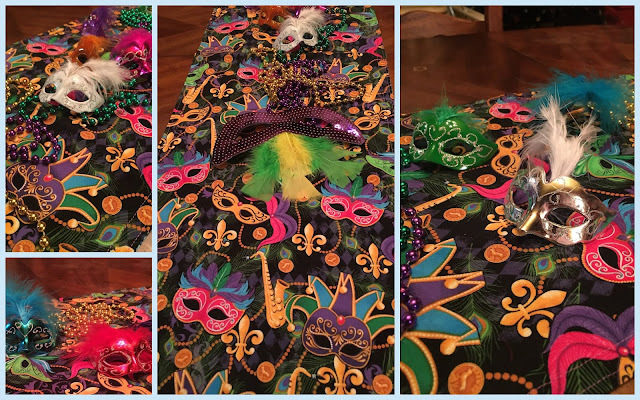 I'll share with a couple blog parties, so make sure you click through to see other party-goers! Happy Spring! I live in Southern Illinois and in the spring and fall, we can have a 75 degree day ... then a 40 degree day! Today, it is cold when it should be warm, so it is a perfect day for a "one-potter". My husband was the king of one-potters! That was his favorite way to prepare comfort food and probably his favorite to eat! He loved this. There are two things that make this recipe better than any other time I've prepared it. I used bread crumbs made with a couple stale Hawaiian (sweet) slider buns, and I used imported cherry tomatoes. 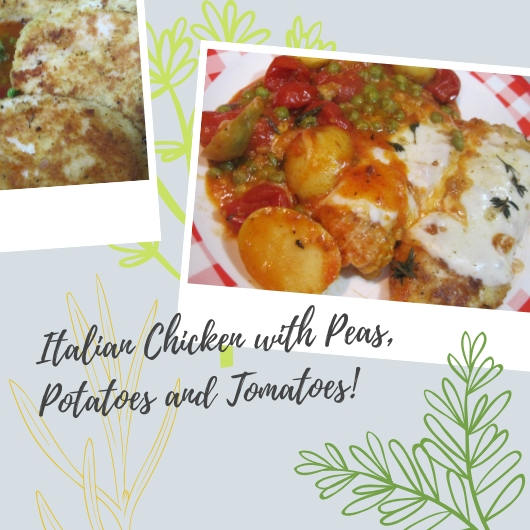 The recipe for Italian Chicken with Peas, Potatoes and Tomatoes is easy. 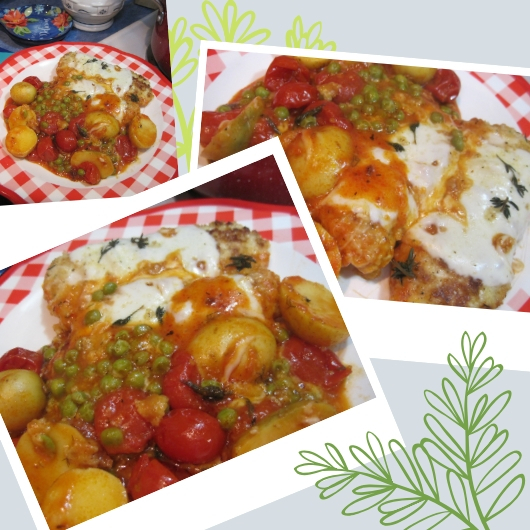 You begin with simple ingredients including 4 thin chicken breast portions; 1 can of stewed, diced or whole tomatoes; a few tiny yellow potatoes; and a handful of frozen green peas. I used dried Italian spices, fresh dill, and fresh thyme. You simply begin by mixing and egg and some water, dipping the chicken in it, then dredging the chicken in bread crumbs mixed with a couple tablespoons of flour and a teaspoon of dried Italian herbs. Gently fry them in olive oil. 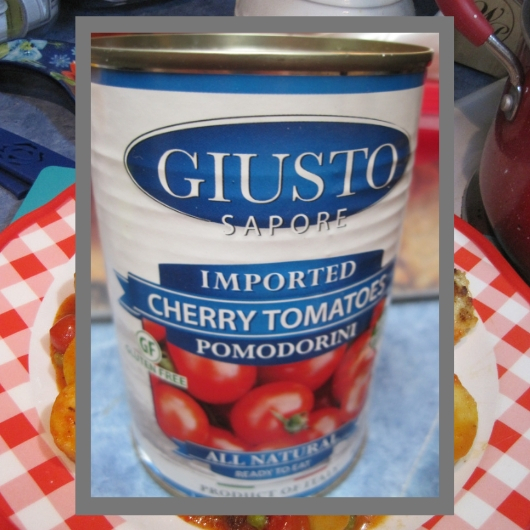 Remove them from the skillet and add the tomatoes with their liquid, another can full of water, the potatoes, a big sprig of dill and a couple sprigs of thyme. Bring that to a simmer, put the lid on and cook until the potatoes are done. Then you add the chicken back to the skillet, add the frozen peas, put the lid back on and simmer another ten minutes. After turning off the burner, the final step is to put a piece of provolone cheese on each breast, replace the lid and let the heat melt the cheese. It is delicious. 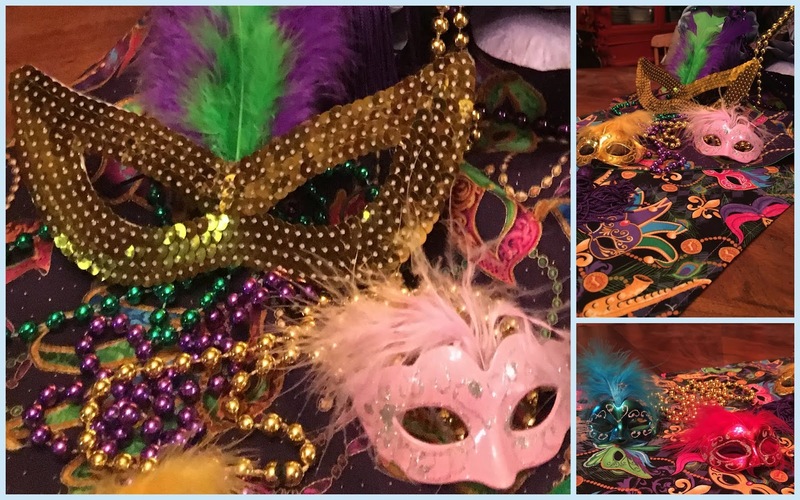 I'll share with a couple blog parties so make sure you click through to see other posts. I have a piece of furniture ... a work bench ... that my husband built for himself several years ago. I was actually amazed when it was finished because it has a highly polished finish on it and actually matches much of the rustic furnishing we have in our house. I say 'we', but Joe has been gone for almost 8 years. What to do with his work bench? 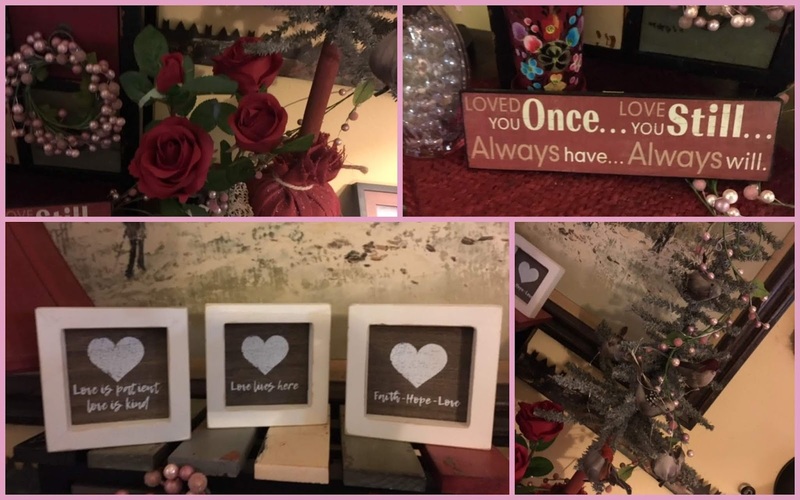 That remained a question for a couple of years, but I eventually decided it deserved a special place in our home and should not be hidden away in the 'craft room'. I moved it around a bit, but finally found the perfect spot. It sits in the kitchen and it is no longer a work bench. It is much more fun to decorate it for holidays than to work at it! I consider all those vignettes as tributes to a man who enjoyed family and holidays. Joe thought I was crazy the first year I kept a little Christmas tree up after Christmas and said I planned to decorate it for each holiday. Later in the year, he became genuinely interested in how I would change it and even suggested things like "lilacs for spring ... sunflowers for summer". I have a small tree on his work bench that I change with the seasons. Here's the 2019 Easter tree! I know ... you can't really see the Christmas tree! That is the whole idea. The little plastic baskets remind me of things from my childhood, but they are not that old! The butterfly was a gift from a friend when I hit 20 years cancer-free! Bird nests filled with eggs, silk flowers and a few other things are added to galvanized string lights and some ornaments that remain since Christmas! 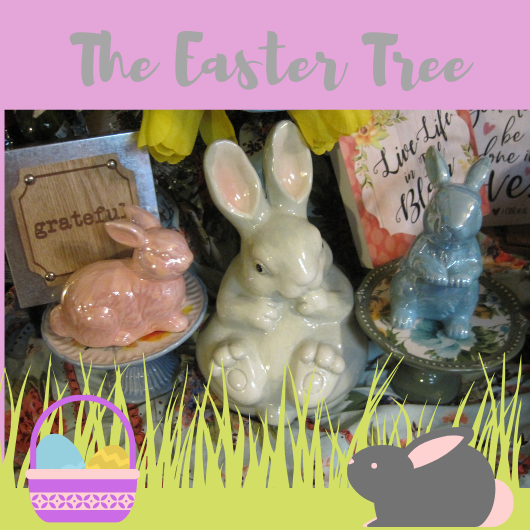 The little ceramic bunnies sit at the base of the tree ... with a few inspirational quotes! I'm into words! 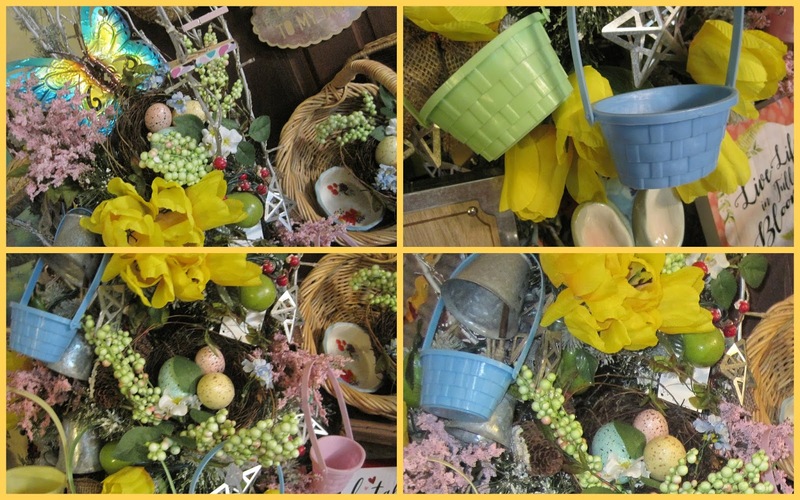 A vintage basket joins a new rabbit picture and ceramic birds ... sitting atop a wooden fruit basket. 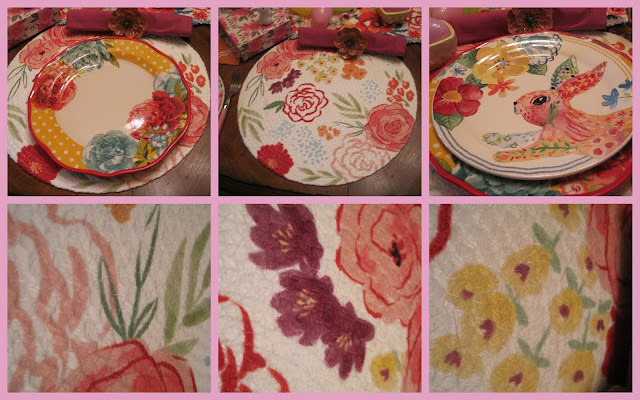 Lastly, I added some of the new Pioneer Woman jade dinnerware to the vignette. I bought this because it looks almost exactly like my collection of Fire King Jadite! I'll show you how much ... in a post later on! Hope you are ready for Easter ... or hope you are getting ready! I'll share this post with a couple parties, so check my sidebar and click through. When I saw the buffalo check Easter decor in the Pier 1 2019 Spring catalog, I knew I had to set that table! Did you know that Pier 1 Imports was founded with its first store in 1962 in San Mateo, California? The first time this Midwest rural chick had a chance to visit a Pier 1 was 15 years later in San Francisco! I fell in love! 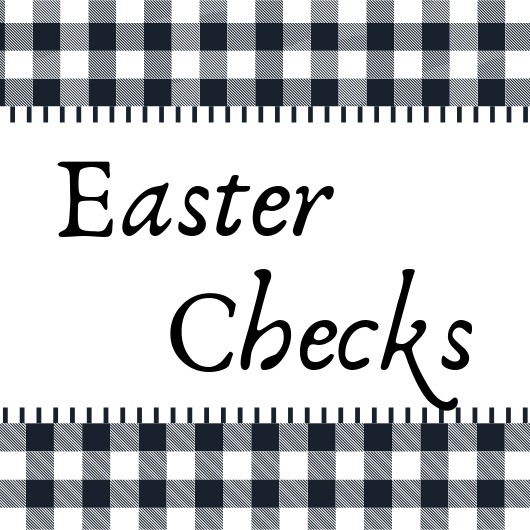 Back to my Easter checks! The first adorable item I saw was the napkin! 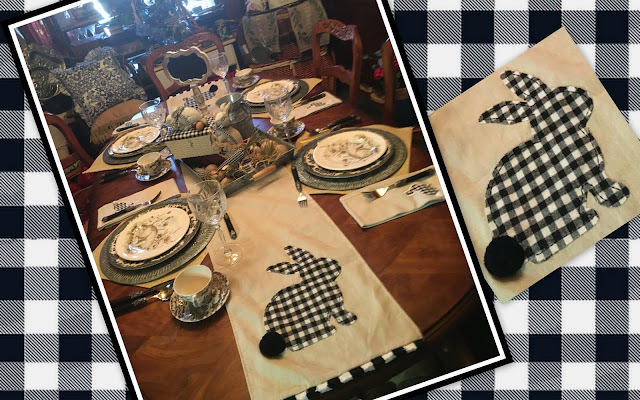 I thought I could build an entire tablescape with just the napkins! I could have, but I was later really enticed by the table runner ... especially because it was on sale! 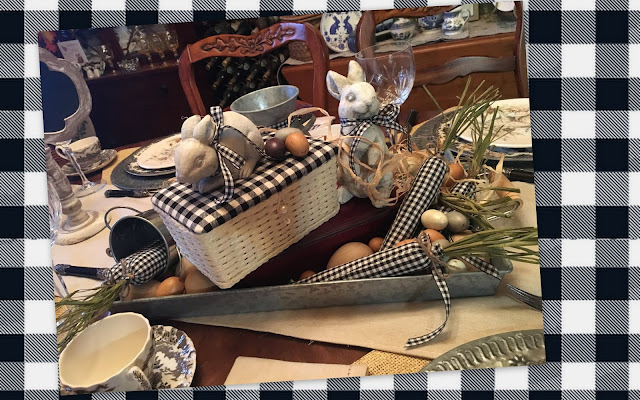 Then, I found this cute basket at another store and the checked carrots on Ebay! I sure was sucked in! Here's the complete table ... and no, this isn't really our Easter table! That is yet to come, but I decided I'd set a series of Easter themed tables for posts and to photograph to include in a family cookbook I'm finishing! If you follow me, you know that I don't get rid of things I really love. I can almost always set a table with treasures in my house or in my storage! 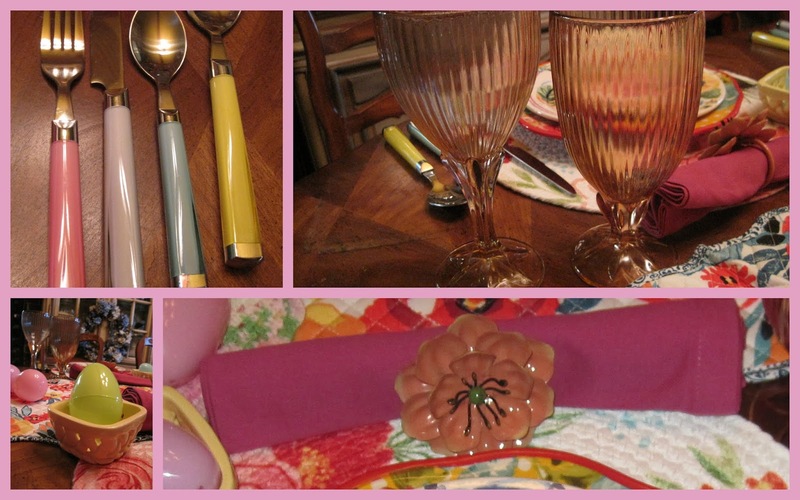 The centerpiece, however, contains lots of new things! 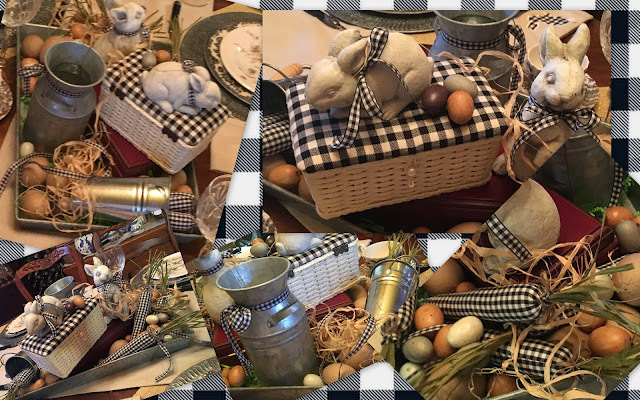 Little stone-looking rabbits adorned with black checked bows, the carrots ... the small galvanized milk can and the cute brown eggs! All very natural looking. The only re-purposed treasures are the wooden box at the bottom of the stack and the tray that holds all of it! This centerpiece could keep a group of ladies for lunch ... talking for hours! A black and white theme for Easter is very unique! As you look at the place setting, you will see all kinds of things that have been seen before! The rabbit salad plate is Pier 1. 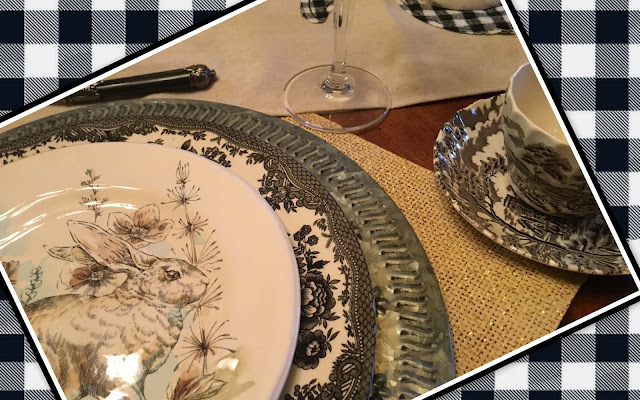 The black and white china is Staffordshire, and the flatware is Cambridge. The charger is galvanized tin and the place mat is burlap with a little sparkle! The stemmed glass is Fostoria. I love the mixture of formal and country! I'll share this post with a couple blog parties! Click through the list on my right sidebar and have fun! When I was a young mom, I would tell people ..."What I do ... I do for Nicole." Now, I am happy to tell you ... "What I do ... I do for Phoebe." This granddaughter of mine has a little bit of interest in cooking ... and a little more interest in tablescaping! If you follow me, you know that I have promised her a Sunday Dinner a month, complete with a holiday theme. We don't care if we can't celebrate a holiday on the actual appropriate date. This family is so busy, it is difficult to do that. We celebrate when we can, but we always celebrate! For me, getting my family around the table for my food is a celebration that I love. 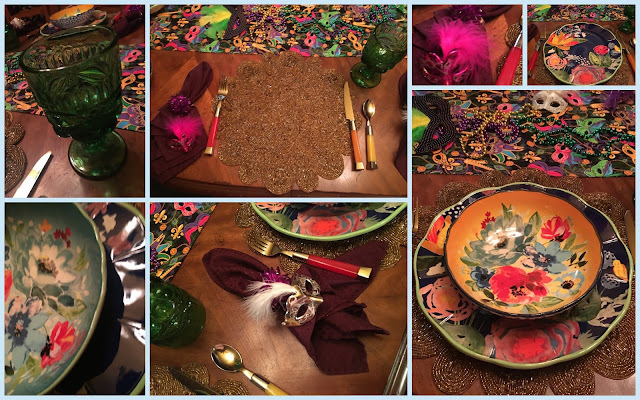 Our centerpiece was all about the table runners and colorful miniature masks! I added lots of beads and a few larger masks. 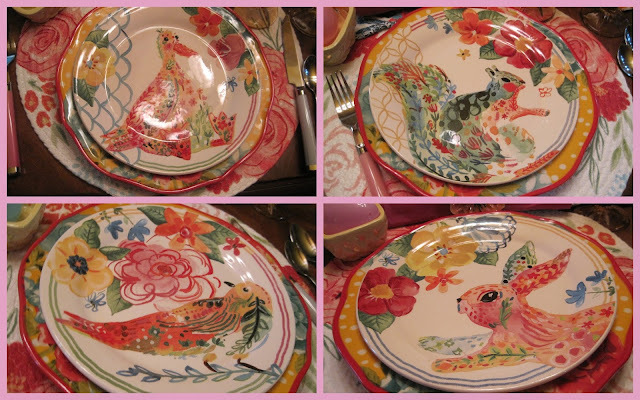 Pioneer Woman's Celia pattern dinnerware is filled with Mardi Gras colors, so they worked perfectly. but the colors added a lot to this casual setting! Purple napkins, purple faux gemstone napkin rings ... cute tiny masks and my favorite vintage Bull's Eye goblets ... round out the colorful setting! 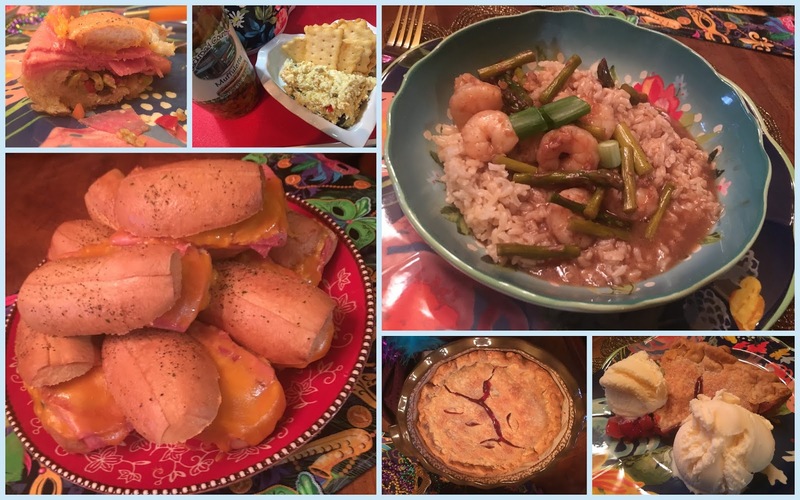 Cajun or Creole food is a part of our standard menu in our households, so thinking of something extra special for this Sunday Dinner took creativity. We have a new Amish market that has an incredible array of luncheon meats, so mini Muffaletta Sandwiches was an easy decision! Phoebe, Nicole and I visited the market the weekend of our event and I loaded my cart with a variety of meats and cheeses. I happy to find a big jar of Muffaletta olive relish on their shelves, too! I sprinkled the tops of my little French rolls not with sesame seeds (as is the usual), but with a garlic butter sprinkle, and that made the sandwiches even better. Sharp cheddar, German balogna, Genoa salami and honey glazed ham filled the rolls. I made an easy egg salad to serve with crackers. In keeping with the theme, a little Muffaletta olive relish mixed with the chopped eggs and mayo created an egg salad with a spicy bite! Our Cajun shrimp was actually quickly stir fried! I tossed the shrimp in a Cajun spice mix and a little olive oil, and then added chopped asparagus to the fry pan. A quick toss and a little sauce made with 2 Tablespoons of Worcestershire sauce, 2 Tablespoons of Sriracha, a sprinkle of brown sugar and a cup of seafood stock. I used the stock as the liquid for a cornstarch slurry to thicken the sauce and stirred in half a stick of butter to finish it. I served it over brown rice, which created a nutty flavored background for the spice. Do you see a King Cake in my collage? Nope! Miss Phoebe asked for Cherry Pie, so that is what we had. I'll share this post with a couple blog parties listed in my side bar. Make sure you click through to see the other posts! In 2019, I have planned to have a monthly Sunday Dinner for my family and will celebrate whatever holiday falls in that month! Miss Phoebe and I agreed that we might make up some holidays! This family is so busy, we don't always get to celebrate holidays on the actual date, so this is a fantastic alternative! In February, we celebrated Valentine's Day two times. The first time on February 14th at my daughter's house ... and the second time a few days later! 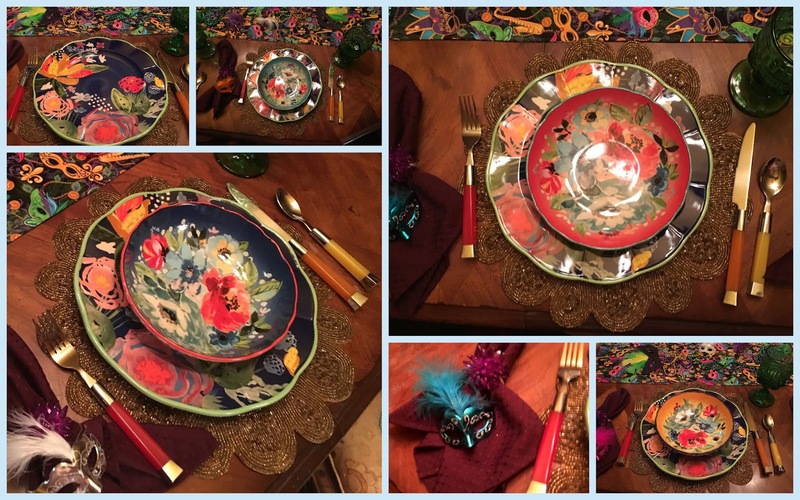 The tablescape was important and it was designed around these collectible Royal Dalton 7 inch plates. 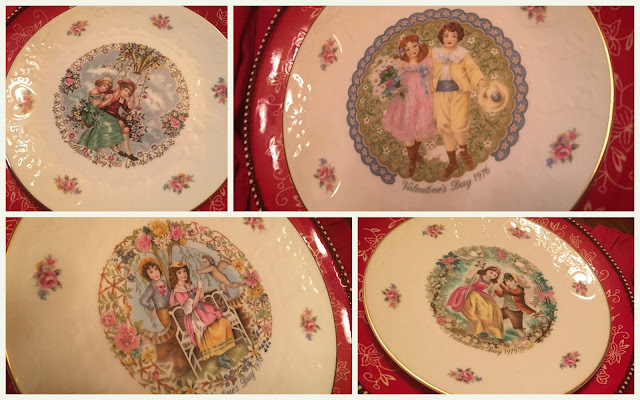 These are beautiful used with any delicate rose china pattern, but Sunday dinners have to be casual, so I used my everyday Temptations! Red was the theme! 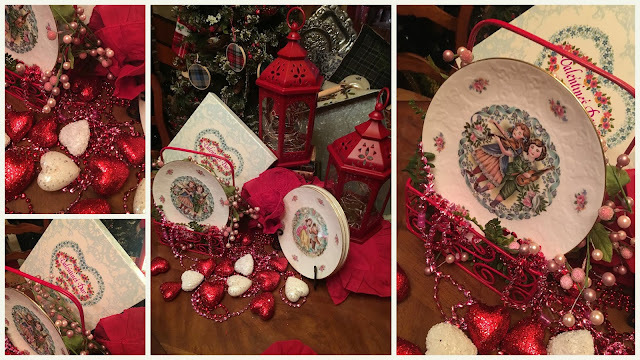 With the Christmas Tree in the background, this quick composed centerpiece (actually on the end of the table) also includes some of the plates and red lanterns repurposed from Christmas! 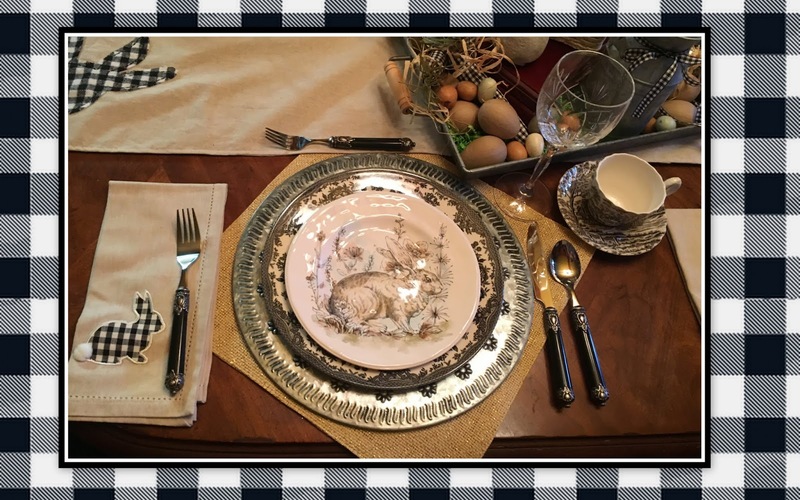 The tablescape was simple! Centerpiece on the end, so we could put lots of food in the center and serve family style! The red placemats and napkins are from Pier 1 ... winter season! 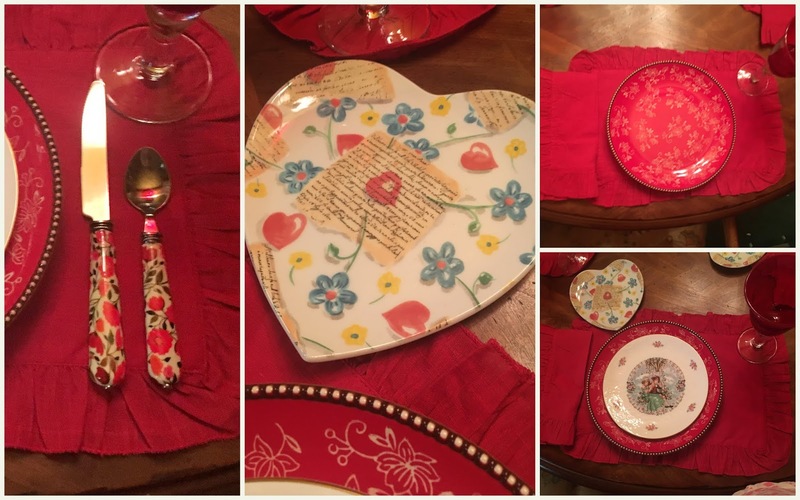 The cute heart bread and butte plates are Williams Sonoma "Letters" and are probably intended for appetizers! Our menu was simple ... Balsamic pork roast, loaded mashed potatoes, fried corn and this easy salad. We all love marinated artichoke hearts, so when a jar is about half empty, I add a nice flavored vinegar (fig on this day) to it and turn it into a nice salad dressing. Butter lettuce, baby spinach and cauliflower ... with the artichoke hearts ... made us happy on this day! 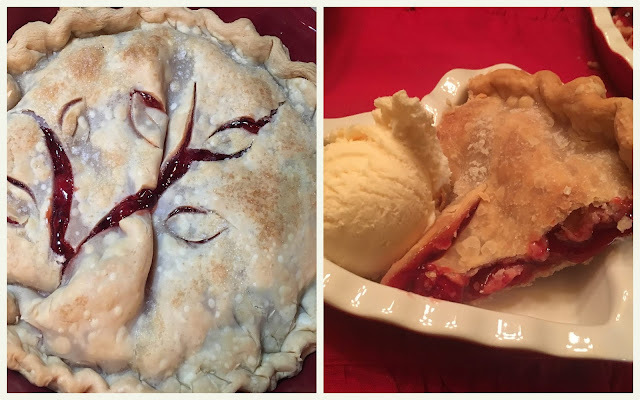 My mother always baked a cherry pie for Valentine's Day and I have carried on that tradition! My cousin recently told me that her mother baked the cherry pie for Washington's birthday! As long as you get cherry pie! Skinnie Minnie Phoebe didn't want pie with her meal, but the leftovers went to her house. Later that day, her mom discovered that she had stood at the kitchen counter and had eaten the last two pieces right out of the pie plate! Happy Valentine's Day ... I'll post on a few blog parties, so make sure you click through!